Boy Scout Troop 601 and Cub Scout Pack 601 have their own website. Click here to see their website. You can also click here to look for scout events on the parish event calendar. Below is some general information about scouts at Saint Thomas More. Boy Scout Troop 601 and Cub Scout Pack 601 are sponsored by Saint Thomas More Parents for Scouting, an organization established by parents of scouts from the parish under the direction of the Catholic Committee on Scouting. The Scouting program for boys is broken into two basic groups of younger and older boys. Cub Scout Pack 601 – Cub Scouts is for boys ages seven through ten (grades one to four). Cub Pack 601 is home to an active group of over seventy boys divided into four grade-based dens with parent leaders. Tiger Cubs is a simple and fun program for first grade boys and their families. The Tiger Cub program introduces boys and their adult partners to the excitement of Cub Scouting as the “Search, Discover, and Share” together. Bobcat gives every boy a basic understanding of the Cub Scout program so they will be able to work with the boys from their own grade. A Cub Scout is a Bobcat only until he earns his next rank advancement. Wolf is for boys who have completed the first grade. The Wolf badge is earned when the boy passes twelve achievements involving simple physical and mental skill. Bear is for boys who have completed the second grade. There are twenty-four Bear Achievements in four different categories. The Cub completes twelve of these to earn the Bear badge. Webelos is for boys who have completed the third grade. As the boy begins working on his Webelos badge he begins the first step in the transition from the Webelos Den into Boy Scouting. As he completes the requirements, he becomes familiar with the Boy Scout requirements and earns the Arrow of Light Award. Boy Scout Troop 601 – Troop 601 is comprised of boys ages eleven through seventeen (grade five and up). Over 35 boys from our parish and the neighboring community develop life skills, have fun outdoors, and contribute service to our community while climbing the trail to Eagle. The goal of Boy Scouts is to develop American citizens who are physically, mentally and emotionally fit, have a high degree of self-reliance and qualities like initiative, courage, and resourcefulness. We also work to help boys develop personal values based on religious concepts and our governmental system, create understanding about and take pride in our American heritage, and develop an understanding of our nation’s role in the world, including a keen respect for the basic rights of all people. We strive to develop boys who are prepared to participate in and give leadership to our American society. The program objectives are to develop character, citizenship and personal fitness qualities among youth by focusing on a vigorous program of outdoor activities. Troop 601 conducts an active outdoor camping program with regular overnight camping activities throughout the year. 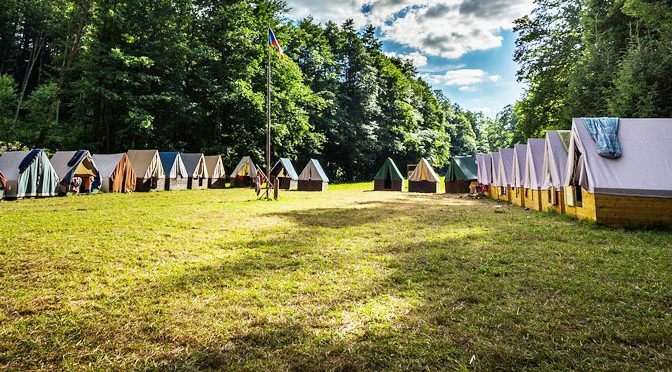 These overnight activities include canoe trips, cycling outings and other special activities, culminating in a nine day summer camping session at H. Roe Bartle Scout Reservation near Osceola, MO. Boys progress through seven advancement levels that are generally divided into lower ranks: Scout, Tenderfoot, Second Class and First Class; and upper ranks: Star, Life, and Eagle. Lower ranks are designed to teach the basic self-reliance skills of the Scouting program: camping, cooking, safe swimming, knot tying, simple first aid, basic citizenship, etc. Upper ranks are designed to demonstrate a Scout’s ability to lead and provide service to others and learn specific life skills and personal growth, including: Lifesaving, First Aid, Family Life, Personal Management, Personal Fitness, Citizenship in the Community, etc. In addition to the progress awards above, boys in both Cub and Boy Scouting can earn religious awards associated with their faith. In the Roman Catholic faith these awards are, for Cub Scouts: Light of Christ and Parvuli Dei; and for Boy Scouts: Ad Altare Dei. In addition, there is an adult Roman Catholic religious award, the St. George Award. On the web: See the Troup 601 web site at http://www.bsa601.org/.